Posted on November 19, 2018 by Andy Higgs in England, Europe, Places, Stay. Remember we were in London last month for some more Pottering about? 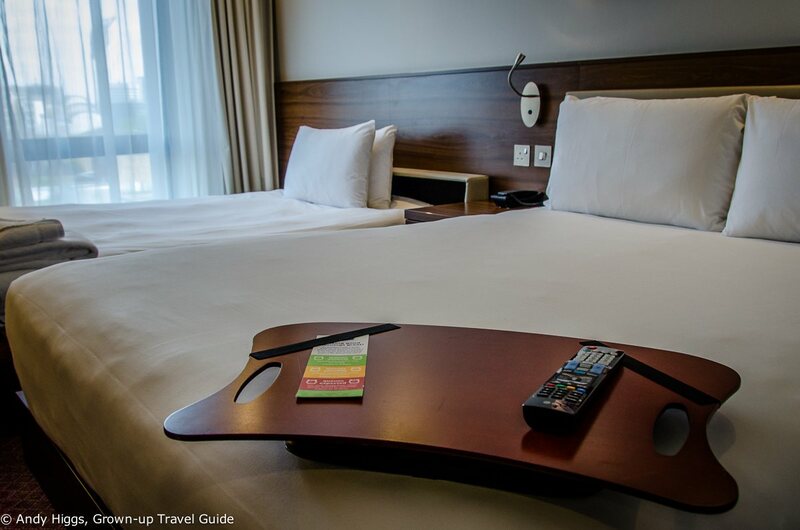 As detailed in the pre-trip itinerary that was published a few days beforehand I had made arrangements to stay at two different hotels in order to se different parts of the city and review them. 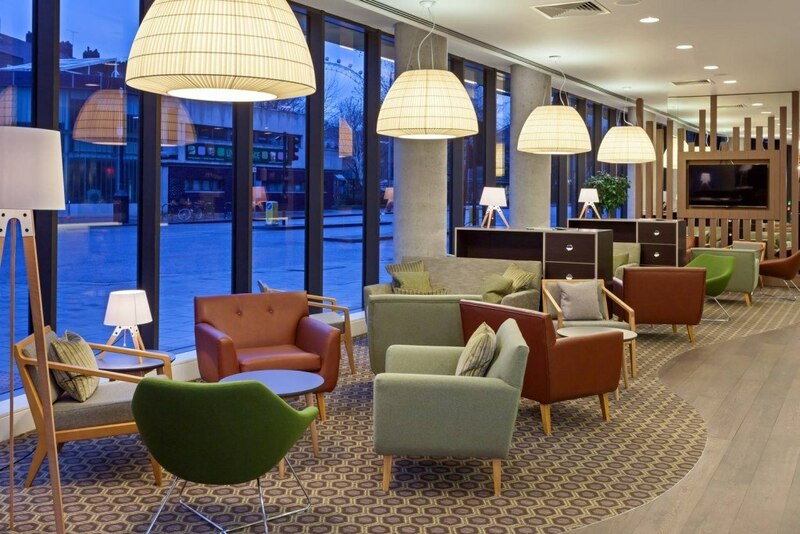 On the first night in town we stayed at the Hilton London Paddington which was rather wonderful; on the remaining two nights we were booked in to another property in the same group but going under the Hampton brand. 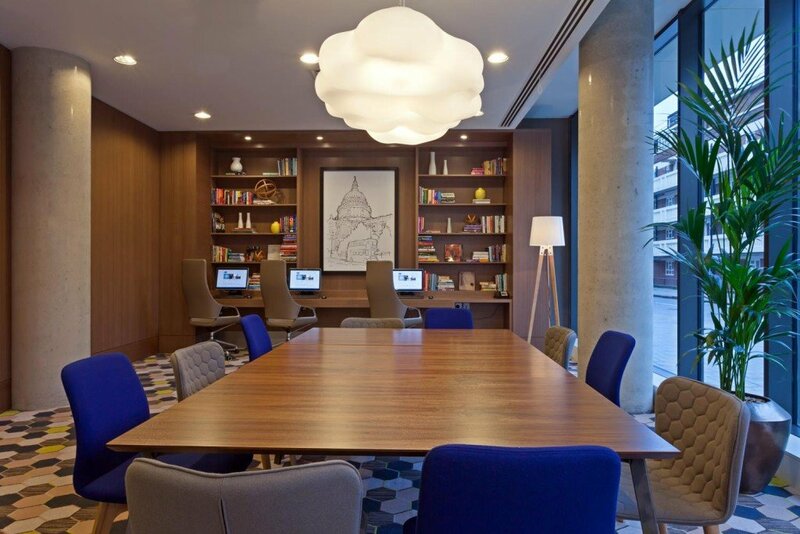 From what I can tell Hampton (and Hampton Inn) are positioned in the middle of the market – aimed more towards families and businessmen who rate good value above out-and-out luxury. 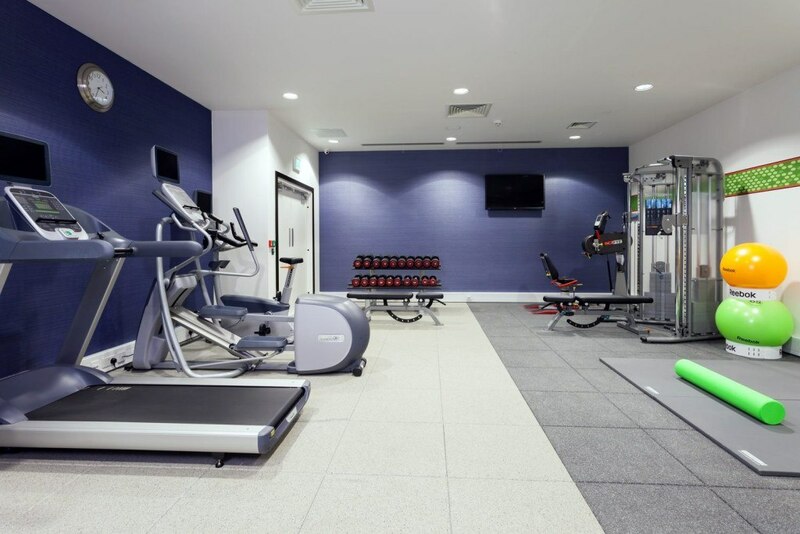 We really enjoyed the two Hampton Inn hotels we have stayed at in Florida, one in Amelia Island and the other in St Petersburg so we had high expectations for this, Hampton’s first property in central London. We received one night free and paid for the second – as always my opinions are my own and unswayed by any discounts – this review is based on paying the regular rate for staying here. Opened 2014, 297 rooms over 8 floors. 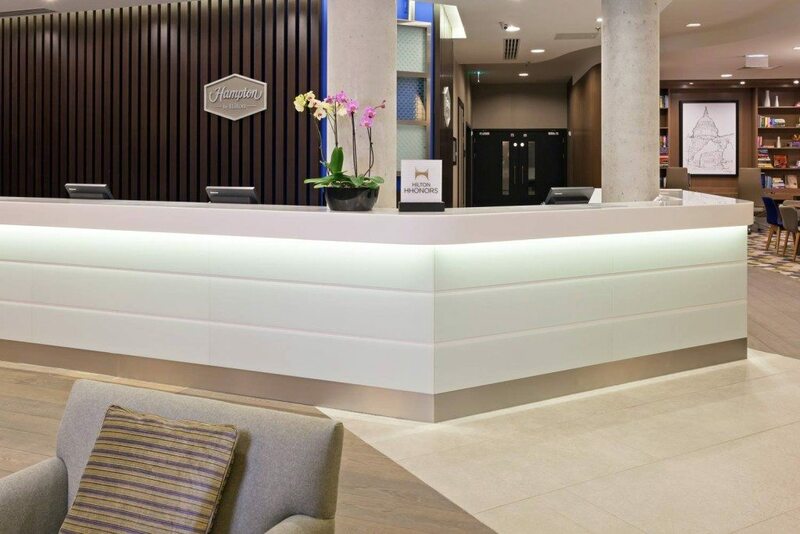 The rather clunkily titled Hampton by Hilton London Waterloo hotel is situated about ten minutes walk south of the River Thames next door to the Old Vic theatre. You can reach Waterloo Station even quicker than that, from which you have excellent Tube and overground connections. The London Eye is also an easy stroll away; there are several excellent pubs within walking distance (including one of London’s finest gastropubs, the Anchor & Hope, right around the corner). Buses stop outside the building and taxis pass by on a near-constant basis. We were travelling by car on this occasion – a beautiful shiny Mercedes from Sixt UK to be precise – and needed somewhere to park it safely for a couple of nights. The hotel is in the Congestion Charge area so if you are on the road between 0700 and 1800 Monday to Friday you’ll need to factor in an extra GBP 11.50 for your sins. The Hampton does not offer parking, but I found what is perhaps the greatest deal in central London, an (admittedly strong) stone’s throw from the hotel. The combination of a superb location, affordable rates and a brand new building (it only opened last year) should be enough to tempt any visitor to London. If that isn’t enough, hot breakfast is always included, as is WiFi – so you won’t get any nasty surprises when you check your bill on checking out. On entering the hotel it is clear that the property is very new – the decor is bright and modern and the style contemporary. Check-in was fast and easy and we were given the code to the WiFi network with our keycard. The lobby area is open and inviting, with a large seating area and bar to the left of the front desk. To the right is a large business area with a big table and three computers for use by guests. We headed past this are to lifts and made our way up to the seventh floor. 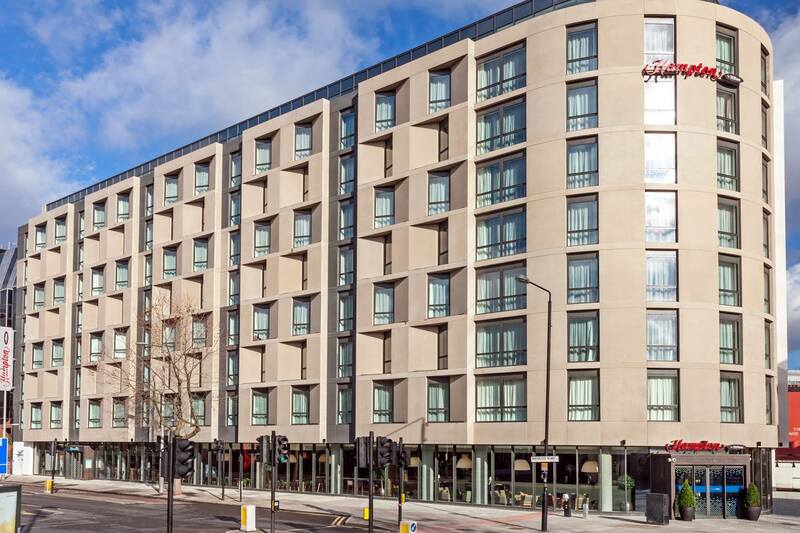 The Hampton by Hilton London Waterloo (perhaps I should just called it the HBHLW?) 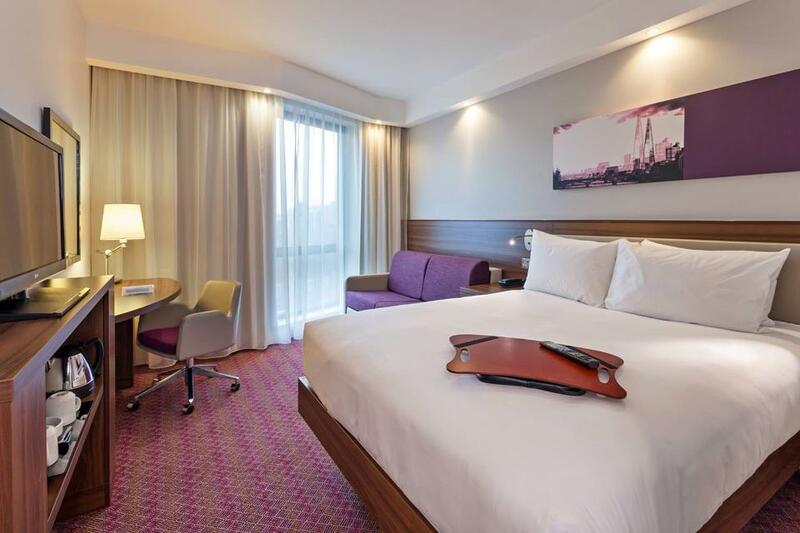 has three types of room: standard, family and deluxe as well in addition to accessible guestrooms which are a variant of the deluxe. We were booked into a family room which featured a very comfortable UK King Size double bed (i.e. 200cm X 150cm bed) a good sized sofabed, flatscreen HDTV, work desk, Hampton’s rather cool trademark ‘lap desk’ for working in bed, iron, ironing board and an alarm clock radio. This is how the family rooms look when the sofabed is less bed and more sofa. Standard rooms are basically the same as the family ones but a chair takes the place of the sofabed. Yes – they were perfectly clean so no complaints on that front. 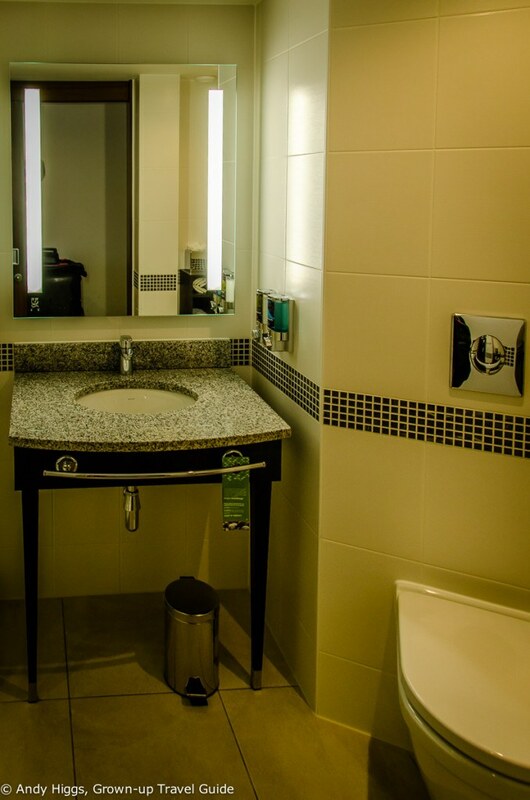 The bathroom was very compact – by which I mean small but well designed. Plus points for refillable dispensers instead of miniature bottles for the shower gel, shampoo and conditioner; a far more environmentally-friendly solution. The water pressure in the shower was excellent but again these designers seem to believe they can thwart basic physics; if you only have half a shower door, water is going to escape. So a towel or two gets sacrificed in mopping the floor, which probably negates the positive effect of dispensers versus small bottles in the long run. Yes. The WiFi was very strong in the entire building. 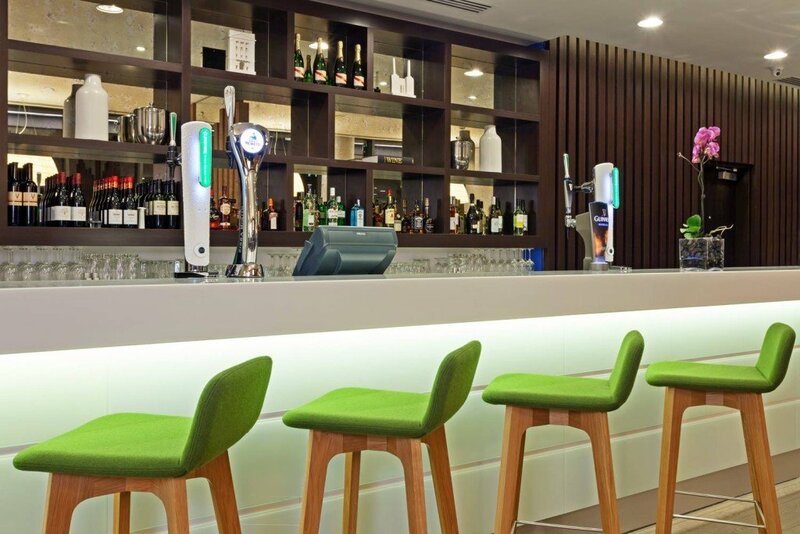 Yes, we tried both – The bar takes up half of the front desk and has a good selection of drinks and snacks at reasonable prices. As well as the funky stools there are also comfortable armchairs in which to relax. Great value and friendly service in an unassuming and laid-back atmosphere – better than you might expect from a mid-range hotel eatery and probably unfairly ignored by many passers-by. Rebecca loved the Bombay Burger and the pulled pork naan was delicious. 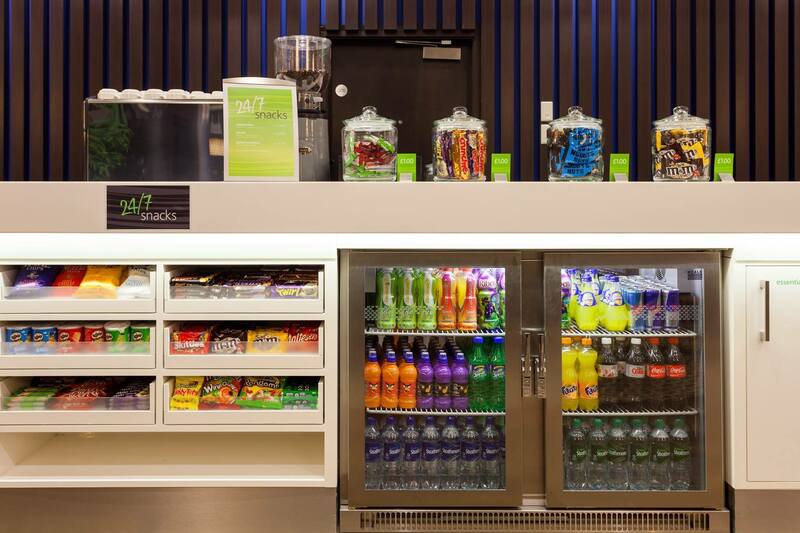 If you are peckish at any time of the day there is also a 24-hour snack service at the front desk. No pool but a well-equipped fitness centre for those who require it. It was indeed – and boy was it popular. We still got a seat, but it is definitely worth reading the information regarding peak times for breakfast. And then trying to avoid them – we found that this was quite accurate as before or after the big tour groups had left things got much quieter. Breakfast was basic, but there was enough variety to ensure that everyone found something to their liking. We experienced excellent, friendly service throughout our stay, from the front desk to the bar, breakfast and restaurant staff. Yes, as mentioned before Hampton is a Hilton brand so you can earn and burn HHonors points here. As always, join if you’re not already a member and with HHonors you’ll gain points for the money you spend in the hotel – not just the room rate but food and drink too. Yes, you can safely leave your luggage here while you are out sightseeing. 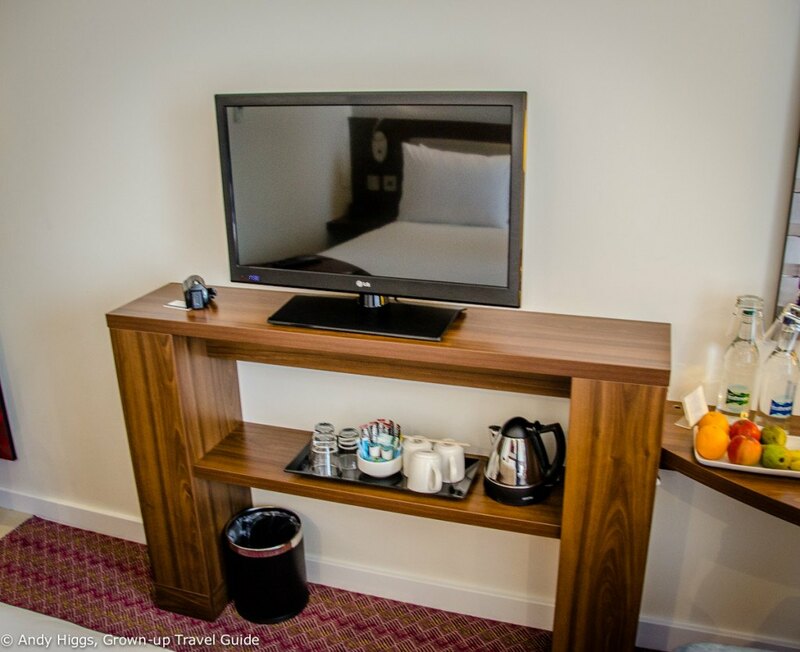 I found room rates starting at GBP 127 per night for two people in a standard double room which is superb value for the location and facilities. As usual you save by booking in advance or taking advantage of one of the many packages offered by the hotel. We paid GBP 189 for three in a family room as it was a busy weekend but I still think it was good value – in hotel terms we are three adults now after all. The location, the contemporary style and level of comfort, the value for money. Breakfast could have been better; a little more variety in hot dishes would have been a plus. 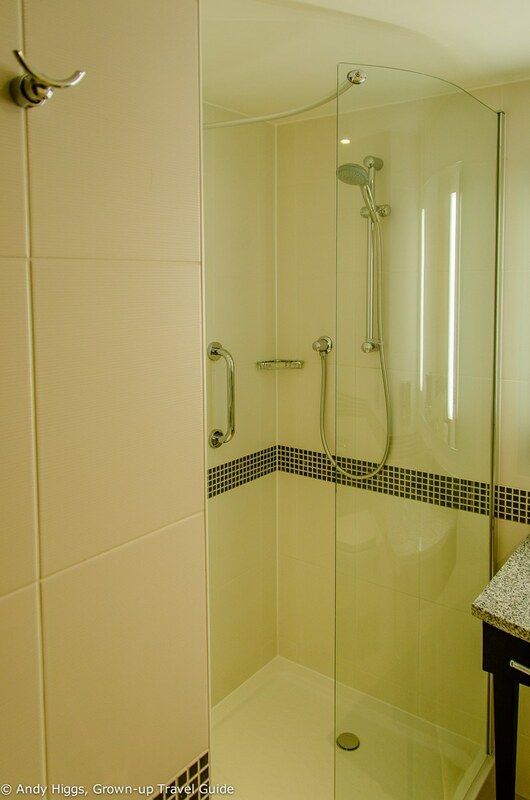 The half enclosed shower is a slightly daft design guaranteed to result in water on the bathroom floor. 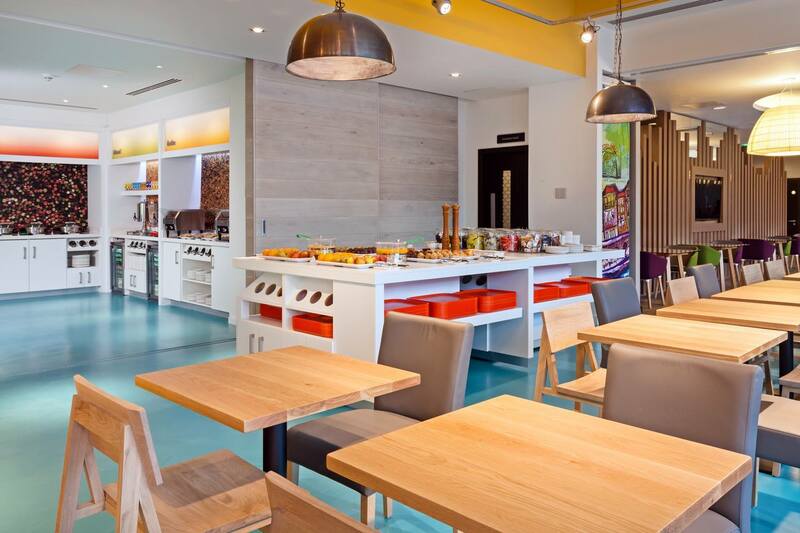 We loved the Hampton by Hilton London Waterloo. 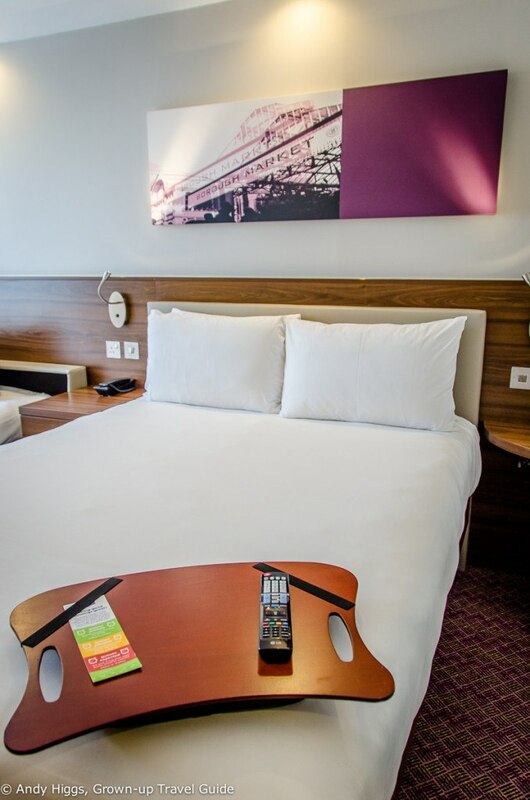 Located in one of the most dynamic and interesting parts of the city with a wealth of attractions in easy reach – many within walking distance – the hotel is one of the best value places to base yourself for a trip to London. 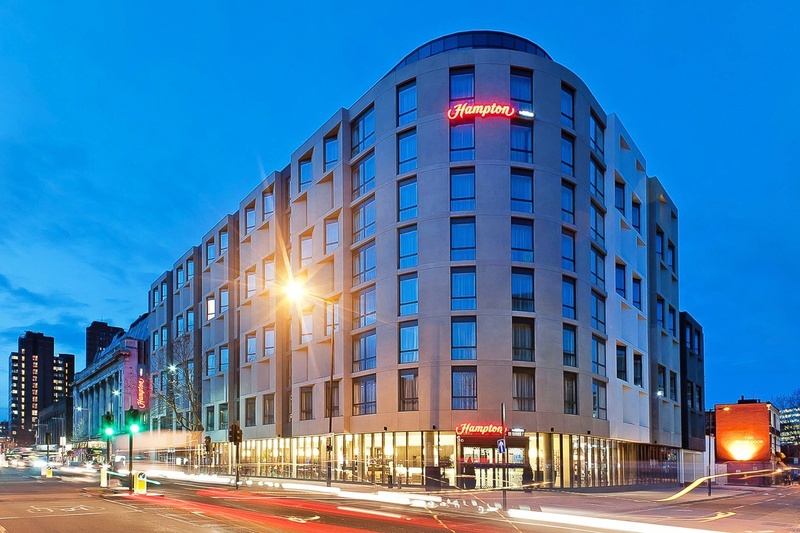 You’ll save money by staying here but it feels nothing like a cheap hotel – indeed the Hampton is now top of the list of mid-range hotels in the capital. I will definitely be staying here in the future, and I strongly recommend you to do the same.